I took one year of French when I was in high school. This was just enough instruction to make me dangerously and hilariously incompetent in the language. I am skillful and proficient in the French words for such things as school supplies, animals, people, colors, descriptive adjectives, and nationalities. However, my French grammar is simply messed up, perhaps beyond repair. As an opera singer, the problem is that you can never entirely avoid the French language. I will never forget when after practicing a French aria, my accompanist (and also a very good friend) burst out laughing as she hit the final chord on the piano. “Your French - it’s so beautifully pronounced, but it’s all wrong. ALL wrong!” A fluent French speaker, she explained to me that I had made every masculine noun feminine and every feminine noun masculine in the course of the aria. Even more, I had made many of the verbs into the past tense. Coming to this comical realization, I stood gripping the piano and shaking with laughter – imagining the indignation of the prideful French people to hear their language mangled in such a beautiful aria as “Gavotte” from Massanet’s Manon. This idea of France as one of the last surviving imperial nations (if only in mindset) was all but completely reinforced by the books I have read about the countries of Africa. Even as France lost its territorial colonies following World War II, it sought to exert influence over much of Africa even up until the 1990s. Instead of exerting political power, it sought to maintain its sphere of influence over the continent through the monopoly of French language and culture over many of its former colonies. This strategy had unintended – and often deadly – consequences, perhaps none more evident than France’s involvement during the 1994 genocide in Rwanda. France provided support and weapons for the government-based genocidaires (who were Francophone and Hutu), in order to “curb” the growing power of the English-speaking Rwandan Patriotic Front (consisting mostly of Tutsi.) This involvement helped exacerbate the genocide, as the government felt as if it had international support of one of the great European powers (with a permanent seat on the UN Security Council, no less) to conduct the massacres. I mention all of this about France because the history of the country of Djibouti is deeply intertwined with France’s colonial ambitions on the African continent. When I went to find a book about this country, I was very disappointed. I could not find any book (in English) that solely focused on this country – not even a travel book. 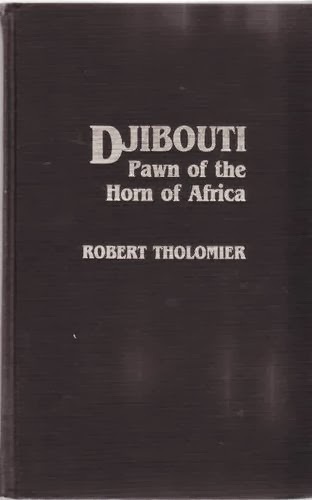 I eventually decided upon an old library book entitled “Djibouti: Pawn of the Horn of Africa” written by Robert Tholomier. It was originally written in French in 1977, the year that Djibouti actually gained its independence from its former colonizer, France. The copy of the book which I read was published in 1981, and was translated and abridged by Virginia Thompson and Richard Adloff. Perhaps, the reason there was nearly no academic literature on Djibouti is because it is a country that is often overlooked – due to its small size. For this reason, I will give some background information on the country and its role in African affairs. This book was published in 1977, and subsequently the information in the book is rather out-of-date. It discusses very little into the development of the Djibouti economy utilizing its location on the Red Sea. It also does not go into the political control of Hassan Gouled Aptidon, who was the first President of Djibouti from 1977 to 1999. I also found that this book was very difficult to read, given the fact that it is quite technical and also a translation. That being said, I found it very informative and interesting to read about the transition from colonization to independence from a book actually written during that time period.